At an extraordinary session of the UNRWA Advisory Commission, in Amman today, the Commissioner-General, Pierre Krähenbühl announced that the school-year for 526’000 Palestine refugee girls and boys will open on time in the West Bank, including East Jerusalem, Gaza, Jordan, Lebanon and Syria. According to the PNN, Krähenbühl emphasized that students and teachers will be returning to the 711 schools on time “because it is crucial to protect the fundamental right to education for Palestine refugee girls and boys and the community’s unwavering attachment to learning and the development of skills”. He added that schools will open, taking into account the fact that host countries have repeatedly drawn attention to the serious risks to regional stability, if this were not the case. The Commissioner-General also underlined the severe ongoing risks facing the agency: “While announcing today the opening of the school year, I wish to be clear that UNRWA is by no stretch of the imagination out of the woods. Since January 2018, UNRWA has mobilized $238 M of additional funding, which is very encouraging. However, we currently only have funding to run the agency’s services until the end of September. We need a further $217 M to ensure that our schools not only open but can be run until the end of the year. This requires the resolute continuation of the collective mobilization that has been underway since January”. “I wish to pay tribute to all our partners, both hosts and the donors who stepped forward at this time of challenge, either by advancing transfers of expected donations or by making new pledges and payments. This tribute includes the Secretary-General of the United Nations whose investment has been critical and outstanding”, said Krähenbühl. The meeting of the Advisory Commission was also called to discuss proposals on how to secure the needed resources, including through special events on the margins of the upcoming United Nations General Assembly in New York. The Commissioner-General called both on all member states of the United Nations who have pledged but not yet transferred their contribution to do so as soon as possible, and on other countries who are still considering providing additional money to join this remarkable and unprecedented effort to preserve UNRWA’s vital services to a very anxious Palestine Refugee community. 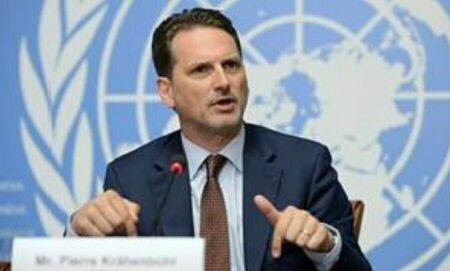 Krähenbühl confirmed that UNRWA will, for its part, take ongoing robust measures to safeguard the financial situation of the agency, focusing on reform initiatives and the identification of efficiencies. Finally, he reaffirmed the the UNRWA’s deep commitment to preserving the dignity of Palestine Refugees, its services and its important mandate.